“So you’re from England, but you want a tour in German? That never happens!” So said our guide at the former Stasi prison. 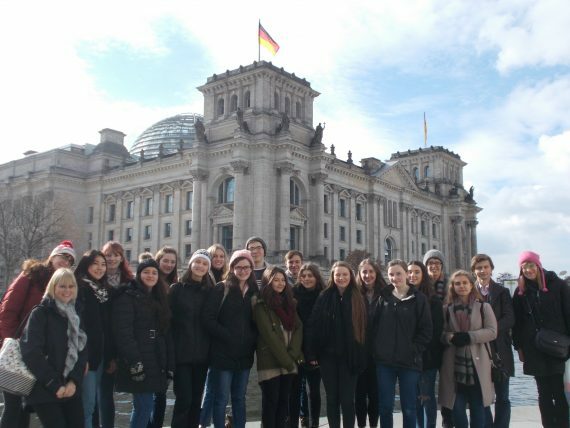 But this was par for the course for our intrepid 19 students from Year 12 and 13 who embarked upon a 5 day study tour of the German capital during February half-term, exploring the social, cultural and political highlights of this most fascinating of European cities. The students had a packed and varied programme, calling on their stamina and linguistic skills in equal measure, from making speeches during a debate on the environment – in German! – during a role play exercise at the European Union information centre, to visiting the Bundestag parliament building, to enjoying an evening of improvised theatre – again, all in the target language. And natürlich, a visit to Berlin would not have been complete without a trip to the Opera, to see an excellent production of The Magic Flute. But the highlight was surely a chance to see the Berlin Philharmonic and a double treat of Daniel Barenboim and Sir Simon Rattle, the latter even meeting up with us after the concert to sign programmes and talk with the students. To say that the students became adults during the trip is not mere opinion, for two of the students celebrated their 18th birthdays with us: congratulations to Darya and Reuben.